Working cooperatively with our watershed communities is one of the most effective ways to reduce stormwater pollution. On July 1, 2018, the Environmental Protection Agency finalized a tough new stormwater permit for local municipalities. We plan to help our communities with their stormwater cleanup efforts through regional cooperation and resource sharing, under the umbrella of the Neponset Stormwater Partnership (NSP). The partnership communities are cooperating on creating key permit documents, printing regional public outreach materials, creating model stormwater bylaws, and figuring out the best way to pay for it all. The goal is more effective cleanup at a lower cost, through economies of scale. Partners include the towns of Canton, Dedham, Foxborough, Medfield, Milton, Norwood, Quincy, Sharon, Stoughton, and Westwood, along with the Metropolitan Area Planning Council (MAPC), and the Neponset River Watershed Association. The Neponset Stormwater Partnership began in 2014 through a Community Innovation Challenge Grant (CIC), which was developed by the Patrick Administration in 2012. The program was meant to encourage and incentivize regionalization based upon the belief that the most crucial and visible interactions between government and citizens occur locally. Read more about the CIC Program here. In addition to conducting its own stormwater technical assistance and public outreach projects, the Neponset Stormwater Partnership is a participant in the MA Statewide Municipal Stormwater Partnership. The statewide partnership brings together groups of communities from across the Commonwealth to share resources, and best practices. The Statewide Partnership has developed the “Think Blue Massachusetts” education campaign with its memorable rubber duckie logo to help disseminate basic stormwater information across the entire Commonwealth and to complement the outreach efforts undertaken by individual municipalities and regional coalitions like the Neponset Stormwater Partnership. Learn more about Think Blue Massachusetts at www.ThinkBlueMassachusetts.org. Dirty water is a big problem! Like much of the metropolitan Boston area, the Neponset River Watershed has many acres of pavement and concrete, which can cause problems with water quality. Polluted runoff, or “stormwater,” is created when rain falls on pavement and is discharged directly to local waterways via storm drain pipes, along with pet waste, bacteria, oil, litter, fertilizer, grass clippings, and other pollutants. Water that flows into storm drains is NOT treated—and pollutants on the street flow directly into streams and ponds, affecting the health of drinking water, wildlife and recreation. 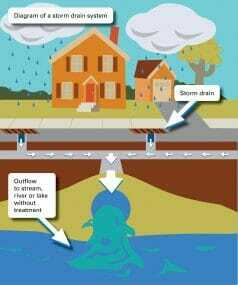 Learn what you can do around your home to help reduce stormwater runoff.